Who doesn’t love to visit the Canadian National Exhibition for the delightfully disgusting creations that pop up every year. We don’t chow down hard on these carnival creations , as most are a heart attack on a plate. But, we like to try them to be able to say we’ve tried them. Chocolate covered bacon, taco in a bag, deep fried butter…you know the stuff I’m talking about. Uncle Betty’s Diner is an uptown Yonge Street eatery that has developed quite a following for its Ultimate Grilled Cheese Sandwich. When I heard about it, I immediately thought of CNE fare. White or brown bread, with melted white and classic cheddar cheese, a slab of homemade mac and cheese, topped with your choice of pulled pork, roasted veggies, or all-beef meatloaf , drizzled with garlic aioli. You may have seen Uncle Betty’s Diner on the Food Network series, You Gotta Eat Here, last year. 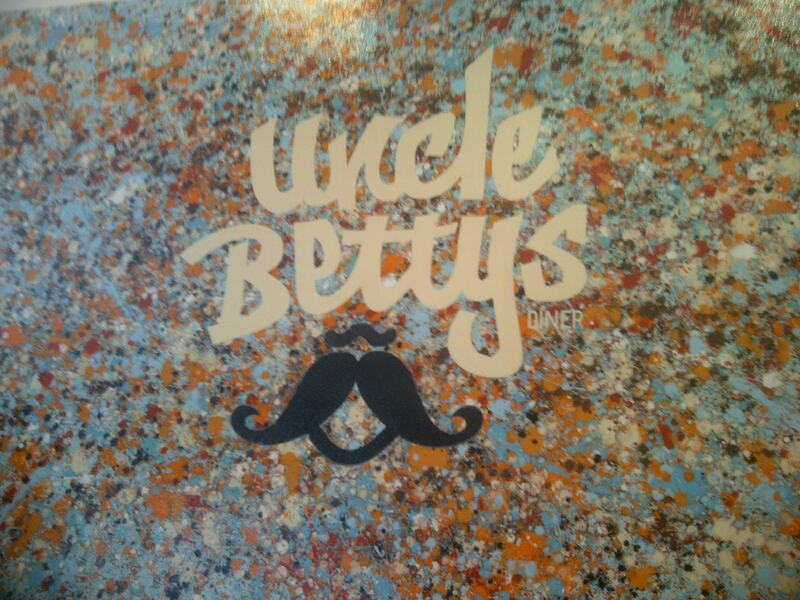 This place got my attention right from the name ” Uncle Betty’s” . 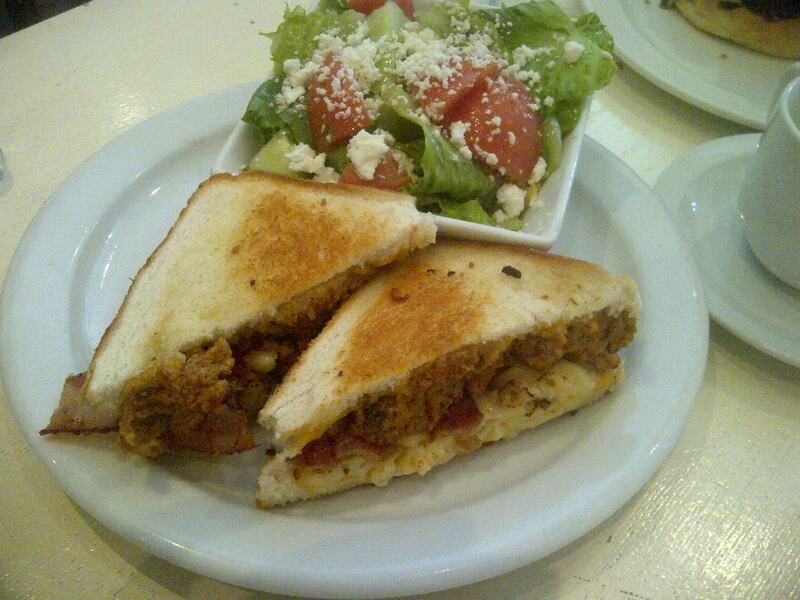 Uncle Betty’s described themselves as, a family owned gourmet comfort food diner specializing in delicious gourmet hotdogs, slow-cooked pulled pork, sloppy joes and the one and only Ultimate Grilled Cheese Sandwich. In case you’re wondering, there really is an Uncle Betty , an Aunt of the owners who was affectionately termed Uncle because of her take charge ways. 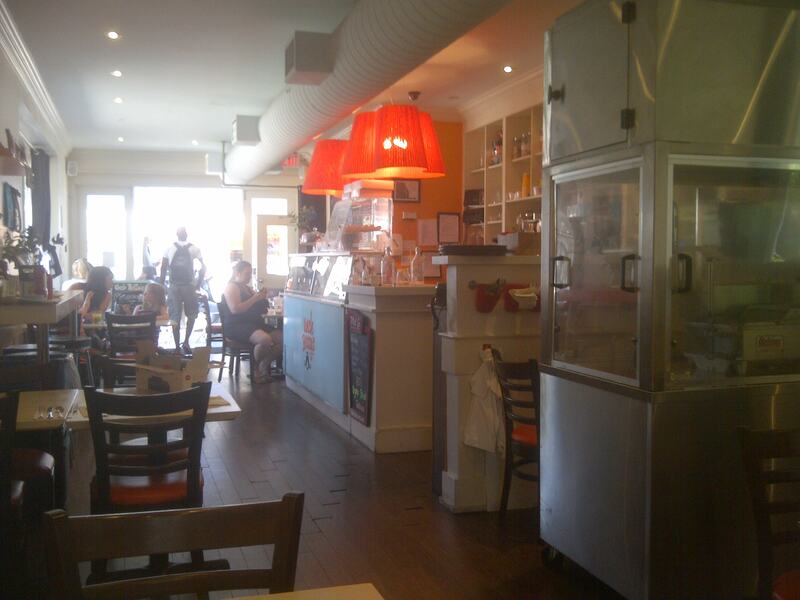 Uncle Betty’s is located on Yonge Street, North of Eglinton at Albertus Avenue. The diner itself is on the small side, but rather than feeling cramped it has a cozy , homey feel. There is an ice cream freezer at the front counter featuring Greg’s Ice Cream. Have you ever had Roasted Marshmallow Ice Cream from Greg’s? If not, get on that. But, that’s for another blog post. We were greeted immediately upon entering and our server was super friendly and fun. When asked about menu recommendations he quickly let us know that if it was a first visit, we had to try the ultimate grilled cheese. But, should we get it with meatloaf, pulled pork or veggies? “Meatloaf, and you’ll thank me later” he said. Okey doke. Giddy up then. He was very attentive to our table , checking on up and topping up drinks often. There was a long-ish wait for food though ( about 20 minutes), considering there weren’t many people in the resto. So, as I mentioned, we ordered the famous Ultimate Grilled Cheese, with meatloaf. We also ordered The Big Steak sandwich and two salads. Splitting the sandwiches seemed wise as the Ultimate Grilled Cheese didn’t sound like it would be wise for one person to finish. We waited with baited breath to see this much talked about Ultimate Grilled Cheese…and finally…it arrived! Oh. Hmmm, not that exciting. Ok, then. So what did it taste like, you ask? It tasted… like a meatloaf sandwich. For something marketed as a grilled cheese that featured cheese AND macaroni and cheese, it was remarkably un-cheesy. You would have to try it to know what I mean, but for now you’ll have to take my word for it. I mean, it was an okay sandwich but nothing to write home about. I would certainly suggest changing the name. It would be a cool selling point to feature a meatloaf sandwich with a piece of mac and cheese instead. But, a grilled cheese it was not. What really made me minus a bazillion points for this sandwich was that IT HAD KETCHUP ON IT. Nowhere on the menu did it claim to feature ketchup. And, believe me …I would have noticed. For those who don’t know me, I. HATE. KETCHUP. Bleeeeecchhhh. The Big Steak sandwich is a grilled steak with caramelized onions, sautéed mushrooms and green peppers topped with chimichurri sauce and roasted garlic aioli on a bun. It was…okay. The steak tasted like it was cooked on open flame (we later asked and found out it was) and that was nice. But, again no fireworks here. 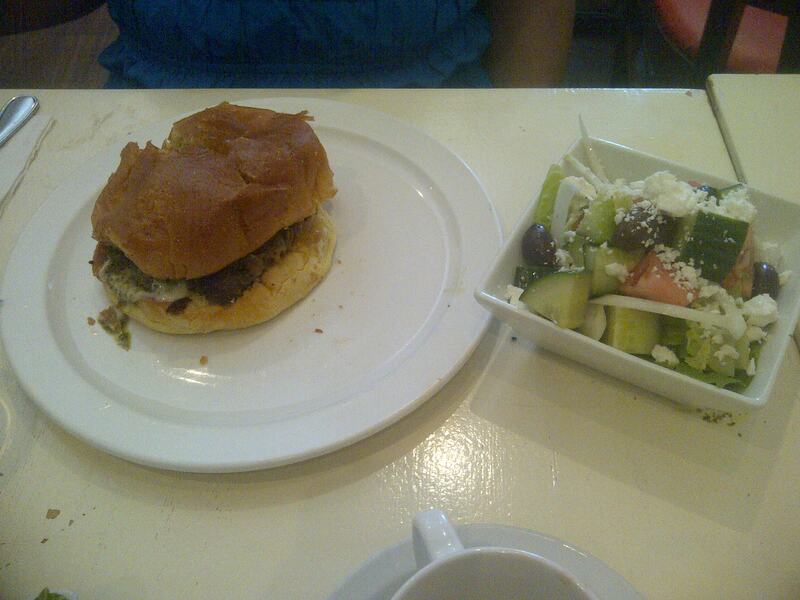 We chose Greek side salads and they were tasty. The Uncle Betty’s menu also featured some epic sounding poutine. If I return, I would try one of those. The Ultimate Grilled Cheese was $15, The Big Steak was $14. Pretty typical for a “gourmet” sandwich with a side salad at a restaurant. I am glad to have given Uncle Betty’s Diner a try. The menu is creative and fun. Although many people love the Ultimate Grilled Cheese, I was underwhelmed with the dishes chosen. I would certainly return but I would try something different. The location is great and staff is outgoing and friendly. I was not bowled over by their fare, but hope to try again. Have you ever been to Uncle Betty’s Diner? Does the Ultimate Grilled Cheese sound yucky , or yummy to you? Throw your hands up for the Magic Bullet! Have not tried the ultimate grilled cheese (and likely won’t based on your review) but their donuts are TO DIE FOR! Looks like I’ll have to go back for some donuts very soon, thanks Suze! The ultimate grilled cheese sounds like something I would definitely order, but if you were not impressed by it, I would have to opt for something else – especially because there are other cheese establishments that do a stellar job with gourmet grilled mac and cheese (Cheesewerks! )…and now I’m hearing about epic poutine and to-die-for donuts, so definitely worth a visit. I was very underwhelmed with the grilled cheese. but , yure right…maybe I set my bar high with Cheesewerks!